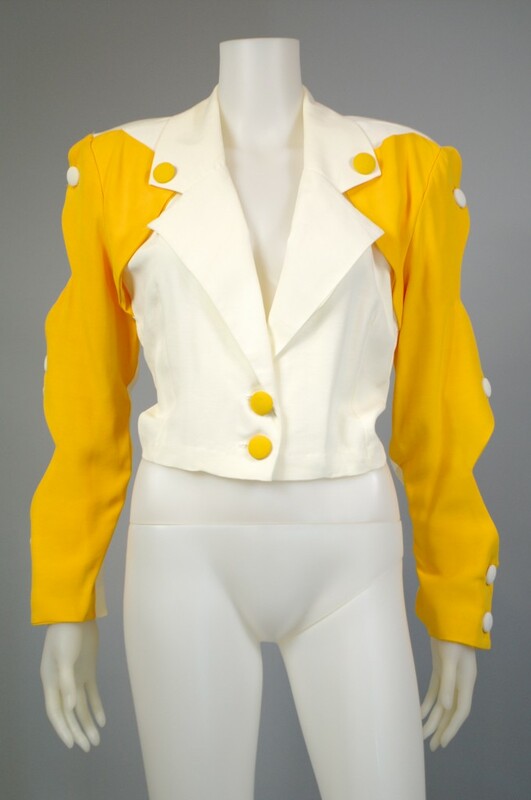 I’ve encountered many vintage lovers who dislike ‘80s clothing trends, shuddering at the thought of stonewash denim, batwing sleeves and shoulder pads. While the clothing styles of 1980s are a far cry from the feminine fashions of the 1950s, I believe that the ’80s is worth honoring because its trends were so avant garde in style, design and wear by the modern woman of her day. 1980s clothing is probably the least liked of all vintage eras. So to help show how vintage blazers from the 1980s are a girls’ best friend when it comes to looking cute ‘n chic for summer, I asked the duo behind Spicy Candy DC to share four great outfits wearing their favorite designer ‘80s vintage blazers to inspire us all to appreciate this underappreciated decade for its style! While the masculine look was a trend for women in the 1980s, not all of the era’s collections were designed for the androgynous girl. Goodwill Huntingg proves that you don’t have to feel like a wide-shouldered football player wearing an ’80s vintage blazer. Keep reading after the jump to see how she styled her ’80s Greek key design blazer in four unique ways for spring! Fish tail skirts show off a lady’s legs without revealing as much as a mini skirt, or potentially overwhelming a petite frame like a to-the-floor maxi style can. I invited Katherine of La Petite Marmoset to style one from the ’80s into four unique looks.